We do say that “looks are temporary and doesn’t matter much in life”. But looks are like the instillers of confidence and self-esteem, so if you feel looks are not a basic requirement for life, then let me say that it is a compulsion in this world. The increase in hair-loss, baldness will make you lose over the confidence of yours. Coming to the feminine section, we can see the increasing rate of baldness and hair loss, which is very frequent these days. If you are a woman and is suffering from these hair issues, then let us share with you something very important. Centers of hair transplant in Delhi, Mumbai, and other metropolitan can be the remedy of this particular problem of yours. Diet deficiency- The feminine group is often devoid of the required nutrients and the minerals like Iron, folic acid and other important elements required for proper health functions. This is one of the major reasons for which hair-fall and other hair issues are quite frequent in females. Medications- Strong medications as well the birth control medicines can lead to side effects of hair loss and other hair issues. Coming to processes like chemotherapy, this also causes hair fall and other hair disorders. The leading medication which is causing the hair disorders is the anti-depressants. a. Hormonal changes- The alternation of hormones are more in females than in the males. This takes place during maternity, childbirth, puberty and the other stages of the females and these changes can lead to the hair issues which lead to baldness at the end. Seeing the crown of a woman’s hair, one can predict the amount of hair lows, so this is one of the important factors which lead to hair issues in the feminine group. 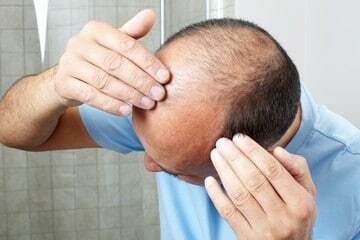 b. Alopecia- Now this can be regarded as the most important and leading cause of hair fall, if you look at the statistics of hair fall in the present day. This is genetically transmitted and if either of the parent or both carry this genetically syndrome then the child is prone to have this particular disease. c. Long-time ailment- This is the last reason for which one can suffer from the hair issues like hairball, baldness and other such concerns. Diabetic patients and patients with thyroid issues often go through chronic hair fall issues. This can be a major concern for the people suffering from the same. How to protect yourself against hair fall? A proper diet needs to be maintained. A diet which should comprise of all the nutrients, vitamins and minerals are required by an individual for good metabolism rate. This is one of the important things which the female strand needs to remember as they are sometimes careless about their diet and mostly miss out on the proteins. Proper maintenance of hair- This is the second most important point to remember, proper cleansing, maintenance and hair treatment s should be undertaken so that the hair is not affected due to pollution, stress and the other factors which drastically initiate hairless as a whole. Medications- The people should keep a note about the side-effects of a particular medication. The effects or side-effects of particular medications should always be noted down positively by the people as it is something very vital for the overall health of the being. Alopecia treatment- The parents are aware from the beginning about the genital traits that they carry so they can avail medical help from the very start to get through the problems with the hair concerns. There are many centers of Natural Hair Transplant and other health portals which can guide you through the complete treatment. Ricky Martin is an online medical counsellor who like to write on topics related to health. My website is NHT India. If you are looking for hair transplant and have some questions related to it, then NHT helps you to find best clinic for hair transplant in Pune, Mumbai, Chennai, Bangalore, Hyderabad etc. with detailed description and cost.